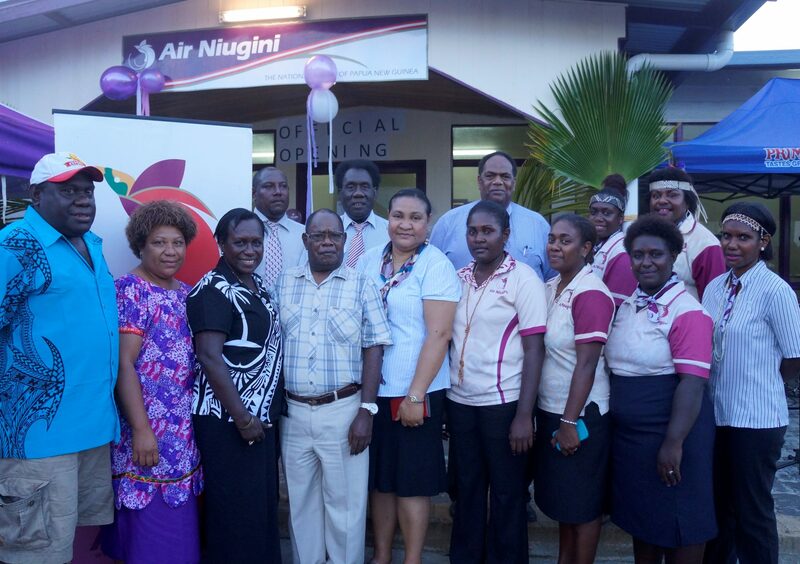 Air Niugini office in Buka, Autonomous Region of Bougainville has now been relocated to a convenient location with a large office space in a more modern building to cater for the increasing customer demand. The office has been relocated to China town near the intersection of Buka town from Patenhai Properties at Hago street. The new office has great facilities including a standby generator and is fully air conditioned. It is one of the few buildings in Buka, if not the first to have glass panels. ANG General Manager, Customers and Markets Dominic Kaumu when opening the new office on Monday (06th June 2016) said customer service is very important to ANG and the relocation of the office now ensures customers have easy access to Air Niugini services. ABG Deputy Speaker, Francesca Semoso(left) and ANG General Manager, Customers & Markets, Dominic Kaumu cutting the ribbon to mark the opening of the new office. Mr Kaumu also said Air Niugini has been supporting the Autonomous Region of Bougainville for a long time and will continue to do so into the future. He said the relocation of the office with modern facilities only cements Air Niugini’s continuous support to the region. “Air Niugini commence operations to this region before the Independence and we continued to do so during the crisis and will remain committed to operate to AROB into the future. Air Niugini is here to stay”, Mr Kaumu said. Autonomous Bougainville Government’s Deputy Speaker, Francesca Semoso who was present for the event urged the people of Buka to look after the new facility. “Air Niugini has been serving this region for the very long time and with the new office now in place, I urged everyone including young men to take good care of this facility, respect the staff and airline service that’s being provided here”, Ms Semoso said. Air Niugini operated from its previous office in Buka for 15 years. The new location is conducive and is conveniently located, ensuring a lot of positive feedback from both customers and staff. Air Niugini operates daily flights to Buka airport except for Sunday. It also operates to Aropa airport, Kieta twice a week, every Monday and Friday, ensuring a total 8 flights to the region in a week.